Home > News > Industry News > London Metal Exchange Aluminum Price Keeps Rising, Why? London Metal Exchange Aluminum Price Keeps Rising, Why? 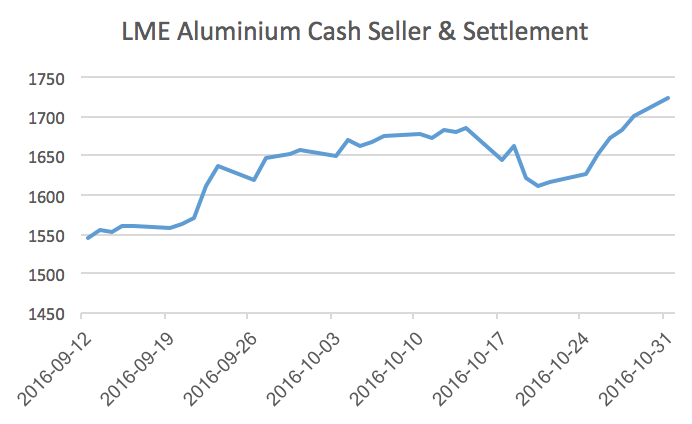 Many active investors in the aluminim market will have watched, perplexed and confused, as to why the London Metal Exchange price continues to rise, yet the fundamental reality is one of, if not an oversupplied market, at least one with no shortage of metal in storage. Producers will claim some credit for cutting capacity and talking up demand, which — to be fair — both positions hold some water. Western smelters in the U.S. and Europe have been relentless in cutting uneconomic refining in the face of weak prices. This graph from CRU shows the steady demise of the U.S. primary aluminum smelting industry and you only have to Google “closure of aluminum smelters” or something similar and you will get a litany of stories about smelters being closed or facing imminent closure around the world. At the same time, though, production in the Middle East has jumped from 0.9 million metric tons (mmt) in 1999 to an expected 5.7 mmt this year, and Chinese primary production has skyrocketed from 2.6 mmt in 1999 to reach 31.2 mmt in 2015, with more to be added in 2016. So, western smelter closures should, in and of themselves, have only limited impact on primary metal shortages and prices. 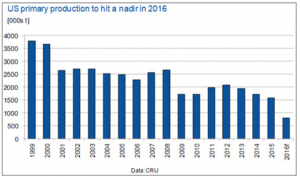 If they create anything of a shortage of metal, it should be reflected more readily in the physical delivery premium, but those have come down steadily from peaks in 2015. Although U.S. midwest delivery premiums are higher than European or Japanese — accurately reflecting the relative tightness of those three market regions to each other, they are still near the historic norms. Investor sentiment has been bullish, driven in large part, Reuters says, by a narrative of falling LME inventory meaning a looming shortage of metal. But Reuters goes on to suggest caution into reading too much into the drawdown in headline LME stocks. The paper says global inventory is anything but dwindling. Certainly stocks of aluminum in LME-approved warehouses have fallen more than 60% to 2.14 mmt from a record high of 5.49 mmt in January 2014. But global aluminum stocks are estimated at around 15 mmt compared to global consumption estimated at around 58 mmt this year and are expected to increase further due to rising output in top producer China. Nor is China’s aluminum in the parallel universe that Alcoa CEO Klaus Kleinfeld once dubbed it, technically locked up behind a 15% export duty. It is, in reality, flooding out in the form of semi-finished product and even primary posing as semis and destined for remelt. That’s the very reason why Japanese physical delivery premiums are lower than European or North American. So, why when global inventory is still so high are LME stocks being drawn down? Well, according to Reuters, we have the LME rule changes to thank for that. 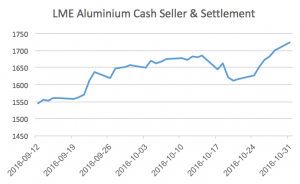 Since 2013, the LME has implemented measures aimed at reducing queues for aluminum as it leaves the LME system, the article says. Measures to cut queues included higher load-out rates for metal to leave warehouses and a freeze on maximum rental rates, but the most effective, so far, has been the cap on rents. The rent payable on metal stuck in a queue longer than 30 days drops by half and after 50 days no rent is payable on LME metal. “The rent capping is why so much aluminum has left the exchange, warehouses don’t want the metal in case they have to store it for free,” the head of one commodities brokerage is quoted by Reuters as saying. Exchange markets like the LME should reflect the reality of supply and demand, but that is in a perfect market that works 100% efficiently and with all parties in possession of all information. In real life, liquidity is provided by investors and they have varying levels of visibility to the underlying supply market and variable timeframes to which they are working. If you are a short-term investor and you see an upward trend based on a wider perception of tightening supply due to falling exchange inventory, you may well jump on the bandwagon and ride the curve for as long as it looks viable — days, weeks, maybe even months, before reality sets in for the wider market and it takes a reverse. Reuters’ position is clear: There is no shortage of global aluminum inventory. The drawdown in LME stocks is not a result of a tight western market, it is a reflection of a distorted warehousing structure. Although changes were made by the LME with the best of intentions, and ultimately will likely prove to be the right decisions, in the short term it has caused a massive outflow of metal that is creating a distorted view of supply and demand.